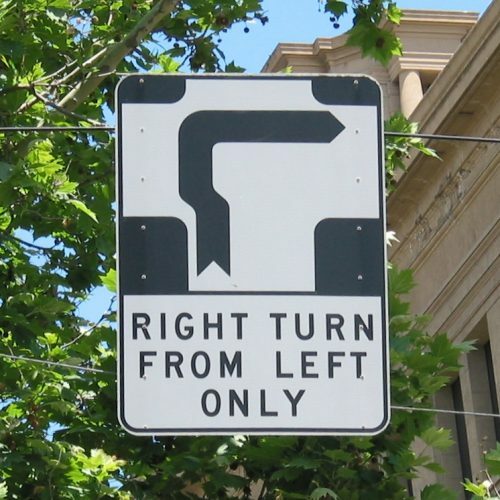 If you’re planning to drive in Melbourne, be prepared for “hook turn” signs. Hook turns involve using the left lane to turn right into a road when sharing a road with tram lines. Sounds unusual? They have a good reason for this. Hook turns can be confusing at first, but if you don’t comply with the hook turn signs, you could face a $117 penalty. Enter the intersection and keep to the far left. Stop at the point where you would turn right. Make sure you’re not on any foot crossing markings. Wait until the traffic lights of the road you’re about to enter turns green. Turn right into the road and continue to drive. Want to practise hook turns? Please feel free to talk to our friendly staff on 1300 717 115.